You just started a PIV in the patient’s right arm and soon after, the patient complained of sharp pain and ask that the PIV be removed. What would you do? Reposition the IV catheter, apply new dressing and leave IV in. Listen to the patient and remove PIV. There are patients who complain of discomfort or mild pain after a PIV insertion or while PIV is dwelling. Many nurses report this scenario as a difficult situation particularly in certain patients who do often have something to complain about. Many nurses report however, they do listen to their patients and take the appropriate action. This was not the case with an ER nurse described in this local news report. “Woman gets $927,000 for botched surgery” . The patient complained of pain after the IV insertion and asked the nurse to remove the IV catheter. The nurse didn’t and the PIV was left in place for over 24 hours. The news report did not include details about the exact location of the PIV. One can only speculate that the IV was placed either in the antecubital fossa or in the wrist resulting in the nerve damage experienced by the patient. Nerve injuries can result from venipuncture. The two nerves most often injured during a venipuncture procedure are the radial and median nerves. The radial nerve passes along the thumb side of the arm, from the shoulder down into the wrist area, and is in close proximity to the cephalic vein. In a venipuncture procedure, the cephalic vein is often the vein of choice for many clinicians. The distal three inches of the radial nerve, just above the thumb, is the area most often injured during the insertion of peripheral IV devices. The median nerve is the largest nerve in the arm. It runs inside the antecubital fossa and passes through the forearm into the palm of the hand. When nurses are drawing blood from the antecubital fossa or inserting peripheral IV devices, they could contact and injure this nerve. Insertion of IV catheters into the superficial veins of the inner aspect of the wrist above the palm of the hand can result in serious injury to the median nerve and carpal tunnel syndrome. This is an unfortunate situation for both the patient and the nurse who admitted “negligence” in this case. Nerve injury related to venipuncture is one of the most common areas of malpractice involving nurses. Let’s make this a learning opportunity and keep the following in mind. Listen to the patient. Like or not, that patient’s are always right! Avoid areas of flexion such as the wrist or antecubital fossa when selecting an IV site. It is very tempting to use these sites because the big veins are located there but resist the urge to use it for venipuncture. Remove the IV catheter immediately if patient complains of sharp pain, tingling or numbness at the site or radiates to areas near the IV site. This is very difficulty especially in the ER where a venous access device is needed immediately to administer medications. Think about restarting another IV in another site and remove the one the patient is complaining about as soon as the patient status allows. 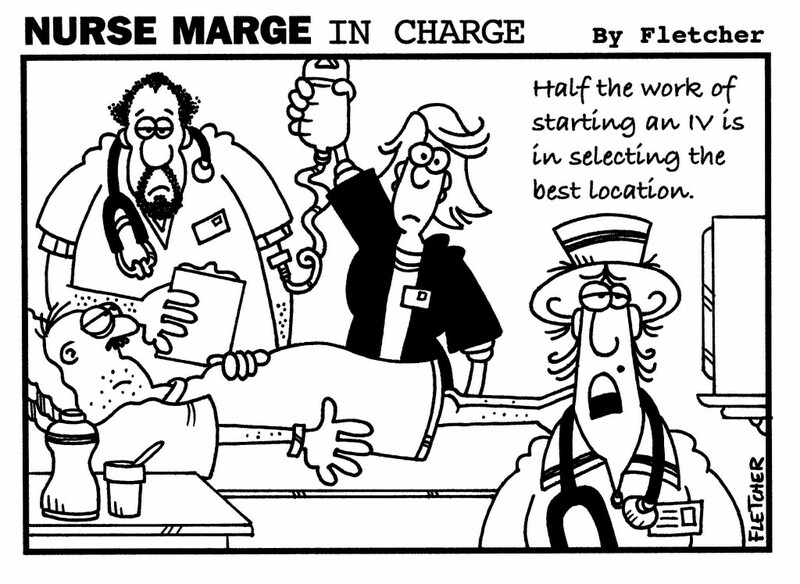 Cartoon from the Journal of Nurse Jocularity January 2008. ← Do you scrub or wipe??? Thank you for your comment. I agree with you…when in doubt…take it out…is a great preventive measure. Thanks for that post, very interesting and informative. I really had no idea what the correct action was for initial question of the post. I have been following your blog for some time and find it most informative. I have had an interest in IV infusion therapy for some time, but I find it hard to obtain the training and experience in the the hospital where I am currently employed since any new positons require experience. I have been working in the PACU for five years and have previous ICU experience. I am willing to pay for training, but I will need to hands on experience? Do you have any suggestions? I live in the Dallas/Fortworth area. Thanks again for a most informative blog. I have made changes and utilized many of the best care practices published on your site. Thank you for your comments. There are many providers who can give you training on infusion therapy and venous access. However, hands-on infusion experience is very important in our specialty and the best way is to ask your employer for opportunities to work with venous access devices and infusion therapies in other areas in your hospital. Good luck!